Get active and train your cat! When you think of cats, obedience isn’t usually one of the automatic words which spring to mind. It's not most cats' strong point - they tend to be very independent and appear to be laid back. They set the agenda for the day and the moment and we, the human race, undertake tasks such as getting their dinner ready on demand. 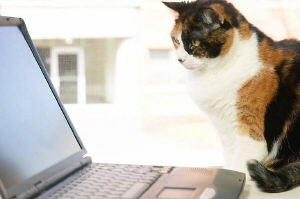 Complete Cat Training would make most cat owners (or, should we say, staff) sit down in stunned amazement. So it may surprise you to know that more and more cat owners are deriving considerable enjoyment and satisfaction from training their feline friends to undertake a variety of tasks, such as the sit, stay, jumping through hoops, and twirling. We know from experience that Trouble is very affectionate and loving; he always knows when we’re feeling down and he comes with a rub against our knees, a gentle loving purr and quiet meow. But cats are deemed outside of the training zone you’d assume a dog to have, so few owners are aware that their cat has amazing capabilities. They don’t think to train their beloved cat. that it's better to play with your cat for a few short bursts, rather than one long one? Why? Because this is what cats do - play in short, sharp stints. Your cat’s mind is stimulated and kept active – lose it or use it! Attract your cat’s attention and obtain the wanted behaviour by using a tool. For instance, if you want to teach your cat to beg, you can use a training wand as a tool to attract your cat’s attention upwards, to rise on his haunches and beg. This teaches the cat to form a conscious association between a particular behaviour and a result. A clicker creates a short, distinct noise at the exact moment the cat performs a certain action – such as at the moment the cat’s bottom touches the ground, if you’re teaching him to sit. And after the click, you feed your puss a lovely treat, so that the cat gradually associates the “click” noise with food. He knows that he will earn treats by performing a wanted action on command. Be patient; he’s an individual and, just like us at school, he’ll struggle with some tasks and pick others up quickly, so give him time. If you decide to train using food treats, do it just before mealtimes, when your cat’s focus will be greater and he’ll want to get that treat! Go slowly – build on the basics before going further. Keep lessons short and interesting and end on a high. This is a real gem of a book for cat lovers. 2. Put the want just behind the crown of his head when he’s in front of you. He’ll have to tilt his head back to watch it and so he’ll naturally have to sit down. 3. As he sits, say “Sit” and as his bottom touches the ground, click your clicker. Immediately after that, give him a tiny treat he can eat quickly. If it’s a large treat, he’ll have forgotten what it was for by the time he’s swallowed it. 4. Do this a few more times and keep repeating until he’s got the hang of it. Gradually reduce your use of the treats.